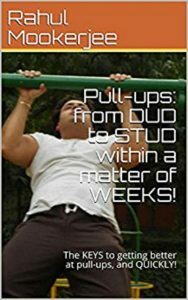 Pull-ups – from DUD to STUD within a matter of WEEKS! From 5 pull-ups … to OVER a 100 daily … provided you know HOW! If you’re reading this, chances are good you know what it feels like not to be able to do ONE single pull-up at this point in time. In fact, chances are that even hanging on to the pull-up bar for any length of time is an exercise in futility for you – and I can understand this predicament. The average Joe today can barely hold on to a chinning bar for more than a few seconds before having to let go, let alone pound out rep after perfect rep on the much feared/admired PULL-UP (or chin-up). And let alone the average person – most gym goers these days are unable to pump out pull-ups in proper form and the right cadence. That guy with the “bulging” lats might be able to crank out heavy poundage’s on the lat pull-down machine, but position him at the pull-up station, and he’ll likely not even be able to do a single one. And that’s not good. Not good at all, because pull-ups are one of the best, if not THE best upper body exercises you can do, period. 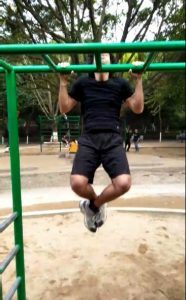 Along with the dip (another super exercise), the pull-up has often being referred to either as “the king of upper body exercises” or “the upper body equivalent of the squat” (which is an expression I prefer to reserve for the dip, but it can be used for pull-ups as well). Pull-ups are also a natural form of exercise – in fact, our bodies were MEANT to perform such exercises. Think about it for a minute – which is the animal in the wild that humans most “resemble” in terms of body structure? Apes – and what do apes (and monkeys) do all day long? Peform various types of pulling movements with their bodyweight – and just how STRONG is an ape? Well, the average gorilla is reputed to have the strength of EIGHT strong men, perhaps more when “aroused”. It has been said that a chimpanzee is strong enough to kill a 1000+ kg crocodile with it’s bare hands. And that’s just off the top of my head – now, thats some SERIOUS strength there, doncha’ think? Could the average ‘bloated’ bodybuilder with “bulging” muscles even come close?? I didn’t think so, my friend. 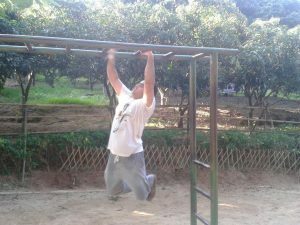 Now, I’d be misleading you if I said pull-ups would get you AS strong as an ape in the wild, but the fact of the matter is that you CAN develop some serious, serious strength if you get good at pull-ups – serious, functional, animal like strength and POWER. Anyone who claims to have developed an “elite” level of strength or even an above average level of strength should be able to perform at least 5 proper pull-ups or chin-ups in one set. This goes for athletes, bodybuilders, military personnel, the average Joe – really, anyone who claims to be way stronger than the average Joe (or Jane). To put it another way – the pull-up is one of the very few “litmus” tests of true strength – there are no two ways around that. There is a reason the U.S. Marines as well as other elite forces around the globe REQUIRE that you get darn good at pull-ups, else you simply don’t make the cut, period. And with darn good reason too, I might add. And – just so you know, pull-ups are not something that MEN alone can do. You ladies out there can get as good or even better at pull-ups than men (in fact, I know a few ladies that have done just that) and I am NOT exaggerating when I say this. 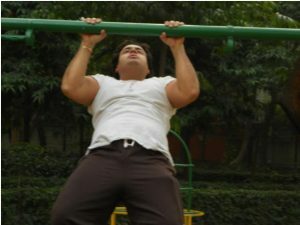 Pull-ups develop ALL the muscles of the upper body without exception, and because this exercise forces you to repeatedly pull your entire bodyweight up against the pull of gravity, they also develop TRUE strength and power throughout the entire back, chest, upper body and core – as well as forearms, wrists, fingers and a grip of steel. Can’t beat those benefits, eh? Pull-ups also make you feel STRONG (a.k.a. “stud”) – in a way that few other exercises can. Remember that one flick where the actor was effortlessly (seemingly so) cranking out rep and rep on the pull-up? The back muscles were standing out in stark relief, the shoulders were strong, large (yet toned) and drawn back, and you could literally see the veins on the forearms pulsating with each repetition. In short the guy (or gal, for that matter) reeked one of thing and one thing alone – STRENGTH. PURE. BRUTE, UNADULTERATED ANIMAL LIKE STRENGTH – and that, is what YOU, my friend will get when YOU order this course. – Ferocious, animal-like strength throughout your ENTIRE upper body, arms, chest, back, abs and core! – Strength that will help you in ALL daily activites from moving that heavy chest of drawers up three fights of stairs, to carrying your loved one (or “significant other” in your arms for long durations without fatigue! – Forearms that look – and feel – like they’re carved out of STEEL! Folks will think twice before trying to “squeeze” your hand, and with good reason! – Massive trapezius and upper back muscles that are EVERY bit as strong as they look. – “Barn Door Lats” – Lats that will make your entire back look as wide as the proverbial “barn door”. – Taut, toned and chiseled chest muscles that will assist you in your pushing movements as well! – Improved lower back strength, and a stronger, more stable spinal column – – oh, and if you have lower back pain, you can kiss it goodbye PERMANENTLY after implementing what this course teaches you. Currently being offered as an e-book in PDF format – so there are NO SHIPPING CHARGES INVOLVED! And finally … the ICING ON THE CAKE that SWEETENS THE “PIE” EVEN MORE! Well, my friend, to be perfectly honest with you – success in any endeavor boils down to a few simple principles – and while the “specifics” may vary in terms of mental or physical endeavors, the BASICS remain the SAME! And in THIS course, I’m NOT going to just tell you how you can literally make your pull-up numbers SKYROCKET through the ROOF – no – I’m ALSO going to give you a few more tips that apply as much to LIFE as they do exercise and physical activity! That’s right, my friend. In 0 Excuses Fitness I gave you the “10 Commandments of Physical Success” (and to be honest I could remove the word “physical” from there if I wanted, so universal are the principles I’ve stated). And in this course, I’m gonna give you a few more tips as well. These were NOT offered in the initial version I put out; but I’ve expanded it NOW – and what you get is the EXTRAS for the SAME PRICE! Can’t beat THAT, can you, my friend? My OWN experience – Experience is a great, great teacher, my friend – and while I wish I had a manual of this nature back when I set my goals – I learned “in the trenches” as it were – and you’ll read about my experience in EXACTING DETAIL! Visualization – Believe it or NOT; this is the MOST important part of THE ENTIRE COURSE. You gotta “see yourself” doing it before you actually do it, and I’ve gone over this in great detail in 0 Excuses Fitness as well, but it bears mentioning HERE too. GUMPTION – Stick to it no matter WHAT! BLOODY MINDED CUSSEDNESS – More of the above, and you’ll read about PERSONAL examples as well!!! A DESIRE to succeed against all odds – And the odds were pretty hefty, or so it seemed. 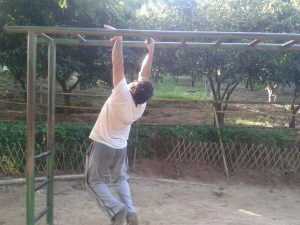 I couldn’t get past 5 pull-ups in a row for what seemed like FOREVER – until I applied what I’ve told you in the course!! And much, much more, including a few supplementary exercises that you should NOT, I repeat, NOT ignore. And also – a BRAND NEW “FAQ” manual – yours completely GRATIS with your purchase. 25 commonly asked questions on pull-ups, and truth be told, they encompass basically everything you need to know about this superlative exercise – and again, this is FREE for you with your investment in the manual. Now, much like with my other courses, what I am teaching you in this course is literally worth hundreds of dollars, if not more, especially when you consider the benefits as well as what most trainees do to GET those benefits (and yet remain unsuccessful). Remember, you do NOT need any gym memberships, fancy machines, “magic” potions, “protein shakes”, and all that other “fun” stuff to reap the benefits of this course – and that very fact would justify a price tag of $70-$80 or more at the bare minimum for this course. Probably a LOT MORE at that, given the PERSONAL experiences I’ve mentioned, and my own perspective on all this which is PRICELESS, my friend. That sort of thing can ONLY be gotten after “doing your time” as it were and I sure did mine. But I’m not even going to charge you that much. I am going to offer you this product for a ridiculously low $54.99. YES, that is right – $54.99 for information that quite literally has the potential to change your health – and life – for the better, and without spending big bucks at that. This course is sold as a simple e-book, and is yours to download right after completing the order. Way less than what most gyms and “health clubs” charge you – upwards of a hundred and MINUS the RESULTS. Way less than what some “personal trainer” would charge you – and still not get you the desired results. And let’s face it, my friend. How many personal trainers have been able to go from doing 5-100 pull-ups – along with OTHER BRUTAL exercises included in such a short span of time? Heck, how many can even DO a pull-up – or 5 perfect pull-ups? Believe me, my friend. I’ve been in this biz for long enough to know that what passes for “good” personal training is anything but. Why waste time and money on personal trainers that don’t have a clue? Ask the average personal trainer to pound out 10 pull-ups and chances are he’ll be “kipping” by the third rep.
And give him a “thick” bar on which to do ’em? He’ll probably scream “Uncle” after the first rep itself (if at all done in proper form). Why put up with all this? Why continue to live with the frustration (of not being able to do pull-ups) for YEARS, and not make any progress towards your goals? Why not make the smart investment – and get the “skinny” from someone that’s BEEN THERE AND DONE THAT – and lives what he writes about? But of course, the final choice is YOURS, my friend. If you’d rather continue to live with the ignominy of not being able to do a single pull-up despite your best efforts and “save” the thirty or so measly smackers I’m asking you to fork over, well, that’s fine by me. Be my guest. As the saying goes, you can lead a horse to water – but you can’t MAKE it drink. If you’re content to hoist heavy weights and think that’ll build the strength you need (while a little voice inside of you says “it won’t”) – well – that’s your choice as well, my brother. No worries. On the other hand, if your truly ready to take that next step towards attaining an elite level of strength, well, I’m here for you. The choice is yours – – and remember, simply “nodding your head” doesn’t rock the boat – ACTION is what does. Take that action NOW. Get in while the going is good, and get started TODAY on the road to pull-up mastery. This guy is the real deal. I encourage all readers to buy his products and benefit like I have. Thank you, Rahul! Rahul is an unusual combination of both brains and serious brawn. And his products shows. Pick a copy of his books and you will get more than your money’s worth in terms of fitness!